The perfect finishing touch for Bruschetta, fish, Caprese..the list goes on and on. Measure vinegar and place into a small sauce pan. Bring to a slow simmer over medium heat whisking every so often. Once vinegar is brought to a simmer, lower the temperature to a med low - low heat. Whisk every so often and simmer until vinegar is reduced by half and flows off of spoon in a steady stream much like syrup. 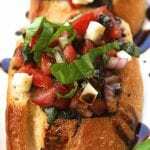 -Balsamic reduction can be done at a higher heat which produces much faster results. I prefer simmering at a lower heat for this recipe as it is easy to burn while focusing on other cooking steps. Starting this as the first step will keep the preparation running smoothly. -Adding brown sugar and wine will give the reduction a deeper flavor and add 10-15 mins extra cooking time.